Material: iron. 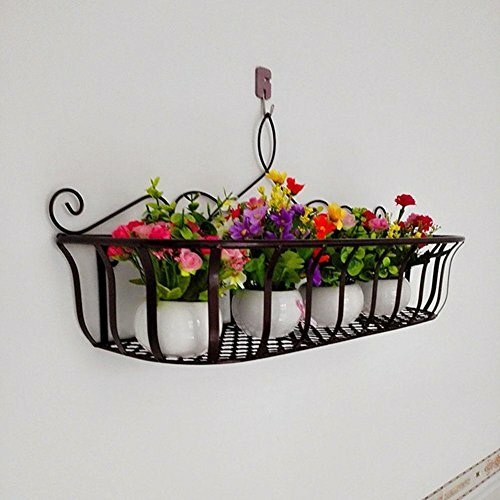 Fashion wrought iron, generous and practical, clean and bright, add a modern color for your home. Clean: Wipe clean with a cloth moistened with mild detergent, wipe dry with a clean cloth. Size: 60 * 20 * 29cm, 53 * 18 * 26cm, 46 * 15 * 24cm. Color: white, copper. In order to prevent metal from rusting, you can periodically wipe the surface with a small amount of anti-rust oil or sewing machine oil to keep the wrought iron furniture as bright as new. If you find furniture has begun to rust, it should be as early as possible with cotton yarn dipped in rust applied to the paint, so you can get rid of rust, but not directly with sandpaper and other rough surface material for grinding. Wall-mounted design, far from the ground, gives the plant plenty of room to grow without touching the ground. Both beautiful and stylish, suitable for home and business. Such as: showroom / counter / kitchen / study / living room / balcony / cafe / bar / hotel / garden / bedroom / porch and so on.